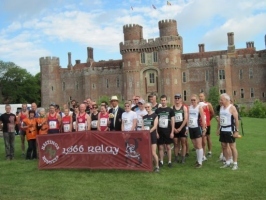 Sunday 6th May 2012 will see the second staging of the 1066 Relay, with circa 60 teams of runners from all over the South East expected to take part in this 5 stage off-road relay organised by Hastings Runners. Sunday 6th May 2012 will see the second staging of the 1066 Relay, with circa 60 teams of runners from all over the South East expected to take part in this 5 stage off-road relay organised by Hastings Runners. The 33.25 mile race starts in the grounds of Pevensey Castle, and follows William the Conqueror's 1066 Country Walk route passing through such iconic landmarks as Herstmonceux Castle and Battle Abbey, before going through Westfield, Icklesham and Winchelsea on the way to finish in Rye. Stage starters include Rother District Council's chief exec Derek Stevens (a former UK international runner), Hastings half marathon supremo Eric Hardwick MBE and Hastings-born double Olympian Sean Baldock. There will be plenty of events going on in Battle Abbey green during the race morning, whilst Battle mayor Ronald Harris and Hastings town crier Jon Bartholomew will be greeting runners across the Stage 2 finishing line near Battle Abbey. Battle accountancy firm Holland Harper will again be sponsoring the 32 page commemorative race brochure; whilst new sponsors Littlewood Fencing will be sponsoring the individual race awards. However race organiser Nick Brown is keen to hear from other companies who might be interested in sponsoring team awards; donating prizes for the huge team of marshals needed for the event; or able to supply water/cereal bars/fruit etc for the runners. Amongst the main marshalling groups are Battle Bonfire Boyes, Battle Muffin Club, Battle & District Lions, Robertsbridge Bonfire Society and Hastings Lions. The inaugural race was a great success, raising over £1600 for various local charities and receiving much media coverage. Stages vary from 3.20 to 11.08 miles, and entries are open to non-running teams as well as running clubs. Please see the race website www.spanglefish.com/1066relay or contact Nick Brown on 07918 907265 for further information.